What is a J Curve? A J Curve is a chart where the line plotted falls at the beginning and rises gradually to a point higher than the starting point, forming the shape of the letter J. It is a phenomenon in which a period of unfavorable returns is followed by a period of gradual recovery that rises to a higher point than the starting point. The phenomenon applies in a variety of fields such as private equity fundsPrivate Equity FundsPrivate equity funds are pools of capital to be invested in companies that represent an opportunity for a high rate of return. They come with a fixed investment horizon, typically ranging from 4 to 7 years, at which point the PE firm hopes to profitably exit the investment., economics, medicine and political science. For example, if you plot the performance and cash flowsStatement of Cash FlowsThe Statement of Cash Flows is one of the 3 key financial statements that reports the cash generated and spent during a specific time period, it acts as a bridge between the income statement and balance sheet of private equity funds, the chart will follow the shape of a “J.” Private equity funds focus on the premise that the internal rate of returnInternal Rate of Return (IRR)The Internal Rate of Return (IRR) is the discount rate that sets the net present value of an investment equal to zero. This guide to calculating IRR will give several examples and who why it's used in capital budgeting, private equity and other areas of finance and investing. If IRR is greater than cost of capital, of an investment drops at the beginning until a level of stability is attained, after which the business can enter a profitable state. 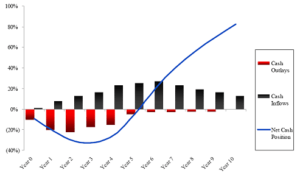 In private equity, the J Curve represents the tendency of private equity funds to post negative returns in the initial years and post increasing returns in later years when the investments mature. The negative returns at the onset of investments may result from investment costs, management fees, an investment portfolio that is yet to mature, and underperforming portfolios that are written off in their early days. Typically, private equity funds do not take possession of their investor’s funds until they’ve identified profitable investments. The investors just commit to providing funds to the fund manager as needed or upon request. After the fund’s identified possible investments and started investing, it uses large amounts of debt and a small portion of the investor’s funds to kick off the investment. Banks that lend to private equity funds negotiate for a ‘cash flow sweepCash SweepThe easiest way to understand a cash sweep and sweep accounts is to think of a cash sweep as any deliberately chosen and automated transfer ("sweeping") of a portion of a company's or an individual's cash flow to be used for a specific purpose - such as paying off debt or making an investment.‘ that requires the fund to pay down its debt with some or all of the excess cash flowValuationFree valuation guides to learn the most important concepts at your own pace. These articles will teach you business valuation best practices and how to value a company using comparable company analysis, discounted cash flow (DCF) modeling, and precedent transactions, as used in investment banking, equity research, generated. In the initial years, the private equity fund generates little or no cash flow for the investors and the initial funds generated are used to reduce the company’s leverage. This concept requires extensive financial modelingWhat is Financial ModelingFinancial modeling is performed in Excel to forecast a company's financial performance. Overview of what is financial modeling, how & why to build a model. A 3 statement model links income statement, balance sheet, and cash flow statement. More advanced types of financial models are built for valuation, plannnig, and and a financial analyst at a PE fund will have to build an LBO modelLBO ModelAn LBO model is built in excel to evaluate a leveraged buyout (LBO) transaction, which is the acquisition of a company that is funded using a significant amount of debt. The aim of the LBO model is to enable investors to properly assess the transaction earn the highest possible internal rate of return (IRR). for the dealDeals & TransactionsResources and guide to understanding deals and transactions in investment banking, corporate development, and other areas of corporate finance. Download templates, read examples and learn about how deals are structured. Non-disclosure agreements, share purchase agreements, asset purchases, and more M&A resources. If the fund is well managed, it will begin experiencing unrealized gains followed by events in which the gains are realized. Leveraged IPOs, mergers and acquisitions, IPOs and buyouts result in increased returns to the fund, and this will take on the J Curve shape. With the excess cash and the after the debts are paid, the extra cash will go to the equity investors. The J Curve incline is determined by the returns generated, and how quickly these returns get back to the investors. A steep curve represents a fund that generated the highest returns in the shortest time possible, while a curve with little steepness represents a poorly managed private equity fund that took too long to realize returns and only generated low returns. The J Curve for American private equity funds is usually more pronounced. These funds usually carry investments at a lower market value. Additionally, American funds are prone to writing up the carrying value of performing investments less than writing down underperforming investments. The value of the profitable investments is only recognized when there is an event like IPOInitial Public Offering (IPO)An Initial Public Offering (IPO) is the first sale of stocks issued by a company to the public. Prior to an IPO, a company is considered a private company, usually with a small number of investors (founders, friends, families, and business investors such as venture capitalists or angel investors). Learn what an IPO is and M&AMergers Acquisitions M&A ProcessThis guide takes you through all the steps in the M&A process. Learn how mergers and acquisitions and deals are completed. In this guide, we'll outline the acquisition process from start to finish, the various types of acquirers (strategic vs. financial buys), the importance of synergies, and transaction costs that forces the company to mark up the investment. In economics, a J Curve refers to a change in the country’s balance of trade, following a currency devaluation or depreciation. A weak currency means that the imports will be costly, while it will be less valuable to export commodities. The imbalance leads to a fall in the current accounts, hence a smaller surplus or a bigger deficit. The high cost of imports will reduce the import volume, and this will cause the volume of exports to rise due to the more competitive prices of foreign buyers. Foreign buyers will be attracted to lower-priced local products. Since domestic consumers will buy less of the imported goods, they will purchase comparable local products that are more affordable than the foreign-originated goods. Immediately after the devaluation of a currency, the immediate reaction is that exports will remain unchanged while imports will increase. Traders with preexisting contracts with foreign producers and manufacturers will honor their agreements. In the short run, there will be a lag in changing the consumption habits of imports, and there will be an immediate jump followed by a lag until traders stop importing expensive products. The demand for expensive imports and the demand for cheaper exports will be unchanged in the short run, as consumers look for cheaper alternatives. The long-term implication of currency devaluation or depreciation is that local consumers will switch to comparable locally-produced products. Also, foreign traders will purchase more products that are being exported to their country than they will buy their country’s products. The products exported to their country are relatively cheaper due to the weakened currency value. At this stage, the country experiences the desired outcome of improving the current account balance. The J Curve forms when the country’s currency appreciates and the value of exports become more expensive than the value of imports.